On 25th April 2015, a 7.8 magnitude earthquake hit Nepal. 7,000 people lost their lives and more than 14,000 were injured. Purna Maya was one of the millions of people who lost their homes in the earthquake. 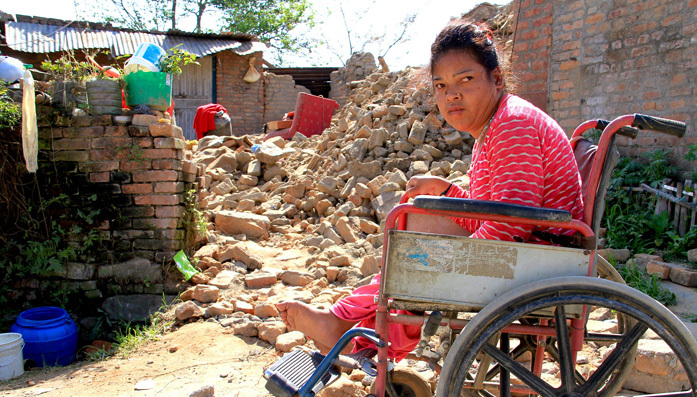 The 36 year-old has cerebral palsy and lives with her father, Maila, in a village just outside Kathmandu. "Purna Maya was inside the house on her wheelchair and I was just walking outside on the street after having my lunch. Suddenly, the ground began to shake violently... Even before I could think of going inside the house and save my daughter, the house collapsed into rubble. I kept looking for Purna Maya but couldn't find her anywhere... Later, when the shaking stopped, I rushed to search for her and found she was buried under a heap of bricks and the wheelchair lay by her side. She was unconscious for a while. An hour later, she regained consciousness. I was glad though the house was gone, my daughter was alive..."
"She had some bruises on her neck and back. But we had no time to treat her. There were continuous aftershocks that day. In the night, we slept in an open field close to the house so that we could keep an eye on what was left in the rubble. Throughout that night Purna Maya was shivering and had difficulty sitting steady on the wheelchair. But on the next day, she saw the other broken houses in the community and gradually became strong..."
CBM’s partner provided emergency shelter for Purna Maya and her father. Often, people with disabilities struggle to access emergency support, such as shelter or food, after disasters. So CBM works with our partners to quickly identify people with disabilities and ensure that they are getting the help they need.